Joerg Bergmeister and Patrick Long take up the 1,000 mile race in Road Atlanta on Saturday from position five on the grid in their Flying Lizard Porsche 911 GT3 RSR, . In qualifying for Petit Le Mans, the final round of the American Le Mans Series, Joerg was only eight-tenths of a second shy of the top GT-class time on the storied circuit in the US state of Georgia. In this race, the five-time Road Atlanta winner shares driving duties with both Patrick Long (USA) and Patrick Pilet (France). The Falken Tire squad posted the 12th quickest time with Bryan Sellers at the wheel. Bryan shares driving duties of the Porsche 911 GT3 RSR with Porsche works driver Wolf Henzler and Martin Raggineger. 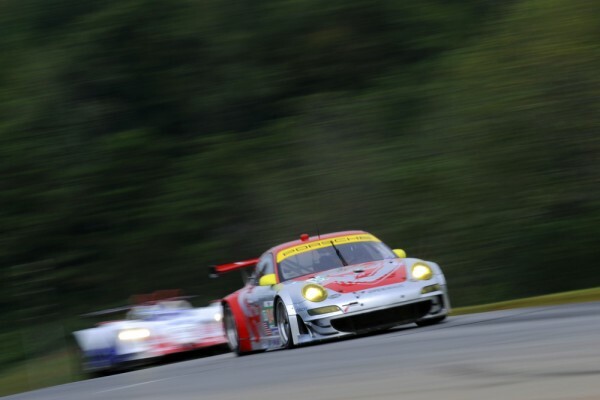 American Darren Law, teammate of Porsche factory pilot Marco Holzer (Germany) and Seth Neiman (USA) in the second Flying-Lizard Porsche, secured the 14th grid spot. Porsche works pilot Richard Lietz clinched the third quickest time with the Porsche 911 GT3 RSR of Proton Competition in the GTE Am class of the Intercontinental Le Mans Cup, . Jeroen Bleekemolen Loses Wheel, Picks It Up, Wins Race. Watch the Video.